Our Lord taught Blessed Faustina a prayer for mercy that she was to pray unceasingly: The Chaplet of The Divine Mercy. He told her that, if she prayed in this way, her prayers would have great power for the conversion of sinners, for peace for the dying, and even for controlling nature (Diary, 687, 811, 1731, 1791). 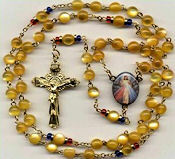 We, too, can pray this chaplet, using ordinary rosary beads of five decades. We begin with the Our Father, the Hail Mary and the Apostles Creed. Holy God, Holy Mighty One, Holy Immortal One, have mercy on us and on the whole world. (Diary, 476).